Minister for Children & Young People, Fiona McLeod, joined children’s charity Barnardo’s Scotland, the Scottish Prison Service and their partners in Perth Concert Hall, Perth on 13 May 2015 to showcase Thrive, an innovative Public Social Partnership (PSP), funded by the Scottish Government and developed to support children aged five years and under, and their families, who are affected by and have experienced parental imprisonment. 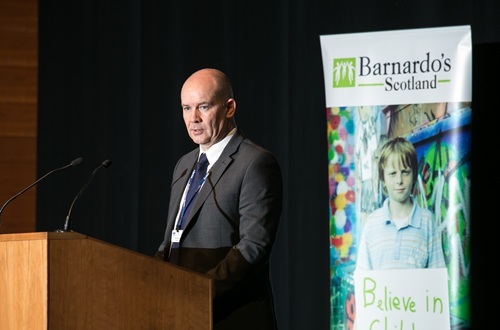 Governor of HMP Perth, Fraser Munro, also gave a speech highlighting the importance of developing family relationships as part of an asset-based approach. Over the last 17 months, the Thrive service has given support to 30 families in Perth & Kinross and Angus - the families include 40 children under the age of five, working in HMP Perth and HMP Glenochil. The development of Thrive was made possible by the collaboration of a number of agencies including Angus Council, Perth & Kinross Council, Crossreach, Enable, NHS Tayside and the Scottish Prison Service. The bond created during the early years between a parent and their baby is essential to a child’s healthy development. When a parent is involved in the criminal justice system this can cause disruption not just to family life but also to the crucial bonding experience across the early years between parents and children. Maintaining that bond while parents are in prison is a key focus for the Scottish Prison Service and through this PSP, partners Barnardo’s Scotland and Crossreach have been building on and testing new and innovative ways of maintaining these relationships. Thrive seeks to improve the quality of the visit experience and provide, where possible and practical, special attachment sessions for parents and children. Pictured below is HMP Perth Governor Fraser Munro talking at the event on the 13th May.